What The Bleep Does Dr. Masaru Emato Know About Water!? WHAT THE BLEEP DOES DR. MASARU EMOTO KNOW ABOUT WATER!? At the WHAT THE BLEEP DO WE KNOW PROPHETS CONFERENCE in Santa Monica, Dr. Masaru Emoto, whose groundbreaking work was featured in the extraordinary film “What The Bleep Do We Know! ?”, took us deeper into his new research into the nature of water. Dr. Emoto joined the other “What the Bleep Do We Know! ?” scientists, visionaries, filmmakers, and film stars as we came together to explore and expand our understanding of consciousness and how we actually create our reality. New research into the nature of water reveals an infinite variety of form and structure. These varieties are reflected in the forms of the crystals of frozen water. Dr. Masaru Emoto, a Japanese researcher, in his groundbreaking book, Messages from Water and in his more recent book, Messages from Water – Volume 2, explains how he freezes different samples of water and then photographs their crystals. He is testing a variety of water samples from different sources and is investigating the effect of prayer, sound and words on the quality of water. Water is life. As the planet is blanketed by nurturing salt seas and fresh water concourses, so are our own bodies, and those of all plants and animals, created from and provided for by water. We are bound to it and it to us so strongly that, as was discovered by Dr. Masaru Emoto, “…the vibrational energy projected by humans in the form of thoughts, words, ideas, intentions, and sounds has the power to alter water’s molecular structure”. Dr. Emoto was working with magnetic resonance fields when he realized that the unique crystalline forms assumed by frozen water indicated that the water bore the imprint of not only its physical state, but also its spiritual surroundings. The initial findings were simple: pure water creates beautiful, snowflake-like crystals while polluted water is entirely unable to form crystals and resembles mud. Dr. Emoto followed this by placing distilled water in front of speakers playing various forms of music, ranging from classical to heavy metal. Soothing, uplifting music inspired the formation of exquisite crystals, while discordant music forced the water to assume distorted forms. He found that positive or negative words and phrases typed on paper and affixed to bottles or simply spoken nearby created vibrations that enacted change in the water’s structure. Words like ‘love’ and ‘gratitude’ had a positive, cleansing effect on water and caused it to form pure, tight crystalline clusters. He also found that deep and focused prayer, even when spoken from afar, had the power to heal large bodies of polluted water. When the speaker was sincere, the words positive, the music beneficial to the soul, or the prayer pure in intent, Dr. Emoto found that the water retained the beneficial changes to its structure for some time. Dr. Emoto compiled his findings in two-volumes entitled “Messages From Water.” Therein he explains how the effect of energy, both positive and negative, can now be clearly seen not only in water itself, but in all living things. As our bodies are mostly water, we are inexorably bound to the element and the molecular changes that occur in response to words, prayer, pollution, deeds, gratitude, and love. Positive energy will effect positive changes within our bodies and negative energy will effect negative changes. While it is empowering to realize that we possess such a level of control over our own health, the implications in regard to planetary healing may be truly profound. Magnetic Resonance In 1989 Dr. Emoto realized that we know almost nothing about the nature of this planet’s most critical life-giving substance. He learned of a device developed by Ronald J. Weinstock called a “Bio Cellular Analyzer.” Dr. Emoto got Mr. Weinstock’s permission to change the name of the device to Magnetic Resonance Analyzer (MRA). Dr. Emoto found that this device gave him a new view on life and on his life in general. Dr. Emoto discovered that all substances and phenomena have their own unique magnetic resonance field, which is converted electromagnetically into 4- or 5-digit numbers through a spectroscopy. MRA can be used for several functions including water quality inspection. Water has a very unusual property in that solid ice is about 10% lighter than water, causing it to float in liquid water. (This prevents lakes from freezing from the bottom on up and destroying the life that exists inside it). He observed that no two types of water have exactly the same crystals and that the shape of crystals mirrors properties of the actual substance. According to Dr. Emoto, modern medicine focuses its observations at the molecular level. However, in order to be able to understand the real cause of a disease so that we may cure it completely, he believes that we must look at the atomic level or even at the micro-particle level. “HADO” Quantum physics describes laws of energy at the quantum level (a “quanta” or discrete particle can be a molecule, atom, nucleus, or micro particle). Discoveries in quantum physics (micro world) are helping us to understand the phenomena of our macro world. The MRA is able to measure, for the first time, quanta in micro levels smaller than molecules. This allowed Dr. Emoto to discover why diseases occur. He expressed his findings in his first two books, Prelude to the Hado Era (1992) and Studies of the Human Through Hado (1994). According to Dr. Emoto, Hado is a vibrational frequency, resonance wave–it is the source of energy behind the creation of all things. (Hado is the specific vibrating wave generated by the electrons orbiting the nucleus of an atom). A field of magnetic resonance is always present wherever Hado exists. Thus, Hado can be interpreted as the magnetic resonance field itself, which is one type of electromagnetic wave. MRA measures the magnetic resonance Hado. From his research with MRA, Dr. Emoto concluded that, “all things lie within your own consciousness.” Thus, he believes that we should do our best to raise our Hado level by doing things such as saying blessings over our food and water, drinking good water and not accumulating negative feelings. HADO AND CONSCIOUSNESS Through his understanding of Hado, Dr. Emoto has become convinced that microorganisms play an important role in our lives. He believes that people become ill due to negative thinking that triggers an imbalance of elements within our body. 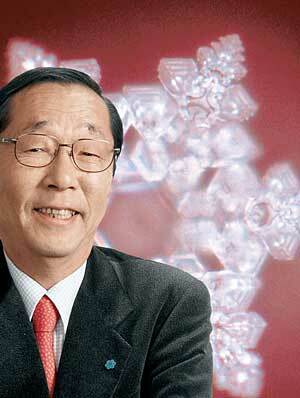 Masaru Emoto was born in Yokohama, Japan in July 1943. He is a graduate of the Yokohama Municipal University’s department of humanities and sciences with a focus on International Relations. In 1986 he established the IHM Corporation in Tokyo. In October of 1992 he received certification from the Open International University as a Doctor of Alternative Medicine. Subsequently he was introduced to the concept of micro cluster water in the US and Magnetic Resonance Analysis technology. The quest thus began to discover the mystery of water. He undertook extensive research of water around the planet not so much as a scientific researcher but more from the perspective of an original thinker. At length he realized that it was in the frozen crystal form that water showed us its true nature through. For a review on Dr. Masaru Emoto’s book, The Hidden Messages in Water , please visit Merlian News Book Reviews .